Ever since he was a kid, Son Goku has fought against evil. Goku meet Bulma when he was 12 and that's where it all began. 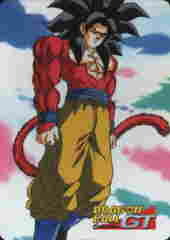 Goku has run ins with the likes of Emperor Pilaf and the Red Ribbon Army while searching for the 7 dragon balls. Goku also destroys the evil Piccolo Daminoh but Daminoh spit out the egg that results in the Piccolo we know today. Goku defeats Piccolo at the 23rd World Martial Arts Tournament and marrys his wife Chi Chi the same day and they soon have a son named Gohan. 5 years later Goku and Gohan (Who is 4, not 5 which is stated in the dub.) go to have a reunion with Goku's friends on Master Roshi's Island, but the visit is interrupted by Goku's brother Raditz. Goku doesn't remember Raditz, but Raditz explains to Goku that Goku is from the Planet Vegeta. He also explains that Goku's birthname is Kakkarotto, and that Goku is a memeber of the Saiya-jin race. Planet Vegeta was destroyed and Raditz needs Goku to rejoin the Saiya-jin race, but Goku refuses once he learns of the horrible acts that Saiya-jins comment like destroying and selling planets. Raditz doesn't like Goku's response so he knees Goku in the gut and kidnaps Gohan. Goku must join with his arch-rival Piccolo to defeat Raditz, and Goku has to sacrifice his life in order to kill Raditz. Goku receives training from Kaiosama in the afterlife to prepare to fight Vegeta and Nappa. One year later Goku returns to life and makes it to the battlefield in time to save Gohan and Kuririn. Goku defeats Nappa and then fights Vegeta. Vegeta beats Goku, but with help from Kuririn and Gohan, Vegeta is defeated, but Goku tells Kuririn to allow Vegeta to live, which at the time seems dumb, but later it proves to be smart decision. Goku recovers and then goes to Namek to help Gohan and Kuririn gather the Namekian Dragon Balls to wish back those killed on Earth. Goku defeats the Ginyu Force (with a little help from Vegeta when dealing with Captain Ginyu.) but Goku must recover because he was injured. When Goku is well, he goes to fight Freezer. Goku arrives to late to save Vegeta, but Goku fights Freezer. Goku seems to have killed Freezer via using the Genki Dama but Freezer survived and kills Kuririn which causes Goku to become a Super Saiya-jin. Goku then beats Freezer and barely manages to leave Planet Namek before it explodes. Goku returns to Earth, and is greeted by Mirai Trunks who warns him of Dr. Gero's Androids that will kill the Z-Senshi. Trunks also warns Goku that Goku will die of a heart virus, but luckily Trunks gives Goku an andiote to save his life. Goku tells the others and they all train for three years to prevent the horrible future Trunks warns them of. Androids 19 and 20 show up and destroy a city. Goku fights Android 19, but his heart virus cripples him during the fight. Vegeta shows up to save Goku's life. Yamcha carrys Goku to recover. Goku recovers and learns of Androids 16, 17, and 18. Goku tells Vegeta and Trunks about the Room Of Spirit And Time, where they can receive a years worth of training in one day. When Vegeta and Trunks finish training, Goku goes in with Gohan and train. When Goku and Gohan finish their training they learn the evil Cell absorbed Androids 17 and 18, and that Cell is now in his Perfect form. 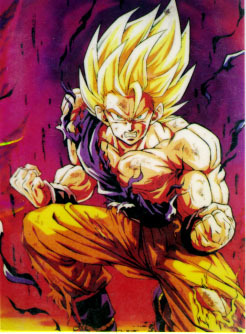 Goku is eventually killed when saving the Earth against Cell, but he returns to fight Majin Buu. However, it was a one day deal and Goku returns to the other world, but Rou Dai Kaioshin exchanges his life so Goku can live. Eventually Goku forms a Super Genki Dama and kills Kid Buu. Goku accidentally gets wished back into a kid in Dragon Ball GT. 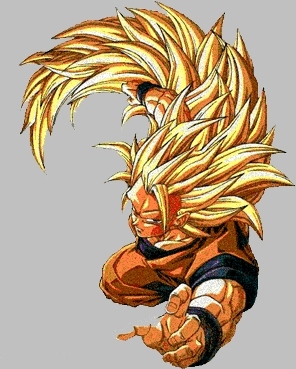 Goku is usually always the first to reach a new level of power. He is the first to go Super Saiya-jin, Super Saiya-jin 3, and Super Saiya-jin 4. Gohan is the first to reach Super Saiya-jin 2. Goku is still just as pure hearted as an adult as he was as a child. Goku loves to eat. 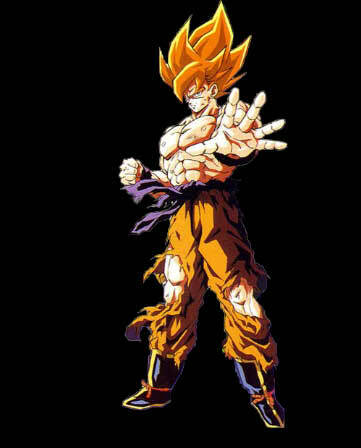 His main attacks are the Kamehameha, Kao Kien, Genki Dama (Spirit Bomb), the Thunder Dragon Fist (seen in movie 13.) Goku's wife is Chi Chi and they have two sons, Gohan and Goten. Goku's father who he never got to meet is Bardock.